One of the most important things we did at this year’s Frankfurt Book Fair was to streamline our rights representation. Anyone who keeps tabs on Maverick House will know that we have been arranging significant deals on behalf of our authors in the past 12 months. Our books are now being translated in various languages and in some cases developed into really super audiobooks. The audiobook of Billy Moore’s A Prayer Before Dawn is a good example. The audiobook is without question as good as the book. Produced by Blackstone Audio, it made compulsive listening. Maverick now has representation in every country in Europe; that means possible translation deals in every European language, of which there are many. We also branched out further appointing translation agents to represent our list in various parts of Asia and Africa, which are traditionally ignored by most publishers but are fast becoming an important sector. This year’s Buchmesse was for the most part grueling, however. We had one meeting after another with agents, distributors, sales teams, printers and ebook developers. Important decisions were made in conjunction with those we work around the world concerning release dates, covers, endorsements and marketing material. One thing that has become very apparent, to us at least, is that our presence in the publishing world has grown exponentially, probably as a result of our online presence, short-films, podcasts and blogs. We are constantly trying to stay ahead of the technology curve and using the internet, new types of software and media to reach audiences around the world. Throughout the week, we received many “cold calls” from publishers who were interested in acquiring certain books, which they had read about online or heard podcasts about. 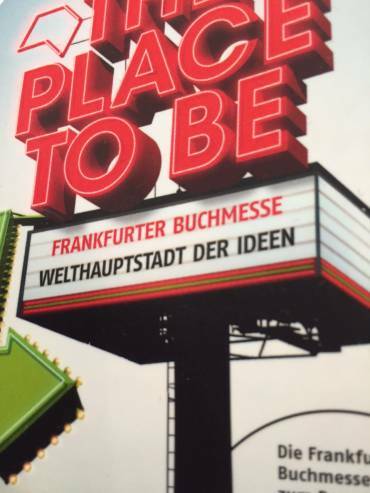 One of Germany’s biggest publishers arrived at our stand unexpectedly asking for a full brief on one title, which they are now considering, having glanced at the book’s cover. The real work starts next week when we will start providing reading copies and sales information to agents and publishers right around the world. Did we commission any titles? To be honest, we didn’t have time to even look, though we were approached countless times by agents with really exciting material, which we will consider in due course.